CINCINNATI (AP) — Sam Hubbard had missed on his attempt to get Ryan Tannehill. The rookie had an improbably easy time completing Cincinnati’s big comeback. The Dolphins (3-2) had plenty of blame to go around for their meltdown, helping the Bengals score those 27 consecutive points with a variety of mistakes — the biggest ones by their quarterback. Andy Dalton threw an 18-yard touchdown pass to Mixon to start the comeback, completing a drive that was extended by T.J. McDonald‘s personal foul on a third-down incompletion. Mixon returned after missing two games following knee surgery and ran for 93 yards in addition to catching three passes. The Bengals’ young defense sealed wins over Indianapolis and Baltimore with late turnovers. Two freaky bounces changed this one in the fourth quarter. Under pressure, Tannehill decided to throw the ball at the feet of tight end Durham Smythe rather than take a sack. Tannehill was hit as he released the ball, which caromed off Smythe’s helmet and went directly to Johnson, who ran 22 yards untouched for the tying score . After Randy Bullock‘s 20-yard field goal gave the Bengals their first lead at 20-17, Tannehill was hit again by Carlos Dunlap and the ball flew to Hubbard, who ran untouched 19 yards to the end zone with 2:37 left to clinch it. Miami made the big plays early, but couldn’t close it out with a 17-0 lead. Kiko Alonso picked off Dalton’s tipped pass near the end zone to stop Cincinnati’s opening drive, Vincent Taylor blocked a Bengals field goal attempt, and Jakeem Grant returned a punt 70 yards for a touchdown with 23 seconds left in the first half. Grant’s 70-yard punt return made him the first Dolphin to score on a reception, a kickoff return and a punt return in the same season. He had a 102-yard kickoff return against Tennessee in the season opener. Grant joins Dante Hall (2003) as the only NFL players with a 100-yard kickoff return, a 70-yard punt return and a 50-yard TD catch in the same season. The last NFL player with a touchdown of all three varieties was the Chiefs‘ Tyreek Hill in 2016. 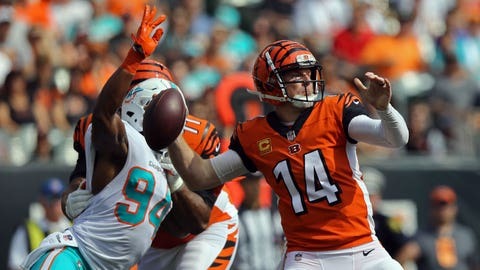 Dalton’s pass for Green was tipped and intercepted by linebacker Kiko Alonso, ending the Bengals’ opening drive and their streak of scoring on their past 34 trips inside the 20-yard line. It was the longest active streak in the NFL. Dolphins: LT Laremy Tunsil left with a concussion during the Bengals’ fourth-quarter comeback, further depleting the Dolphins’ offensive line.